Hurrah, no more mind numbing long swims! 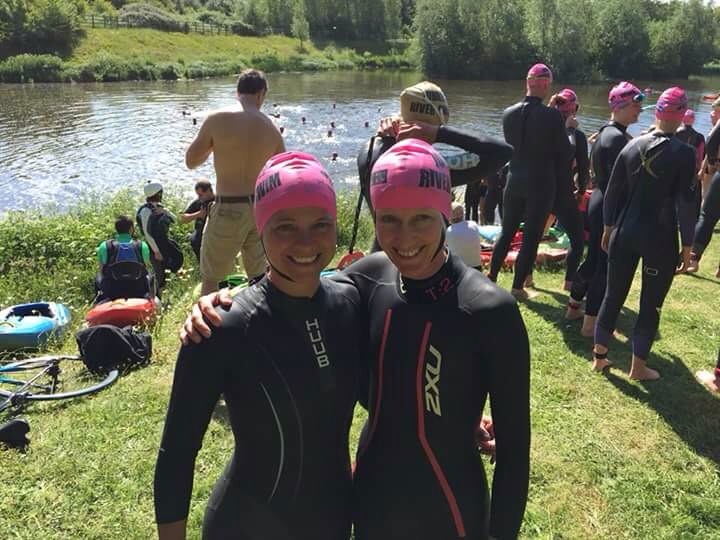 After 3 months of swimming endlessly up and down a pool and round a cold lake, I completed the Jubilee 10k river swim on the 7th June (not really selling it to you am I!) My friend Jo and I decided to take on this challenge after taking part in the event as a relay team with GreenlightPT last year as we’d really enjoyed it. I also missed doing endurance events after not being able to do long runs anymore so thought this would be a good alternative. We hadn’t been able to get as many open water long swims in as we had hoped for leading up to the event as the water temperatures never really got high enough, starting with training swims at 13 degs up to a balmy 16 degs in the end. This meant that most of our training swims took place in the pool, luckily I managed to do mine in the 50m pool which was somewhat easier than the 25m pool. 2.5hrs of continuous swimming in a pool on your own is certainly character building! However, come event day we were both confident that we would be able to complete the distance if the cold didn’t get us. The swim is split into 4 sections of 1.9k, 3.5k, 2.6k and 1.5k as you have to get out to walk around the 3 weirs along the route, this helped to break up the distance and enabled us to refuel. We had roped our husbands in to be our support crew so that we knew we would have food, drink and encouragement at each pit stop, which they dully supplied (thank you boys). Our strategy was to take it in turns to lead and draft off one another, swapping over every 20mins, to give us a break from sighting and hard swimming and it worked really well. The start of the race was a bit more chaotic than anticipated, as I suppose the relay team swimmers in ‘compete’ mode, rather than the ‘complete’ mode we had adopted. We had decided that I would lead out the first 20mins as I seem to be a bit better at pacing than Jo on long distances and to be honest I was worried that she would go speeding off into the distance! 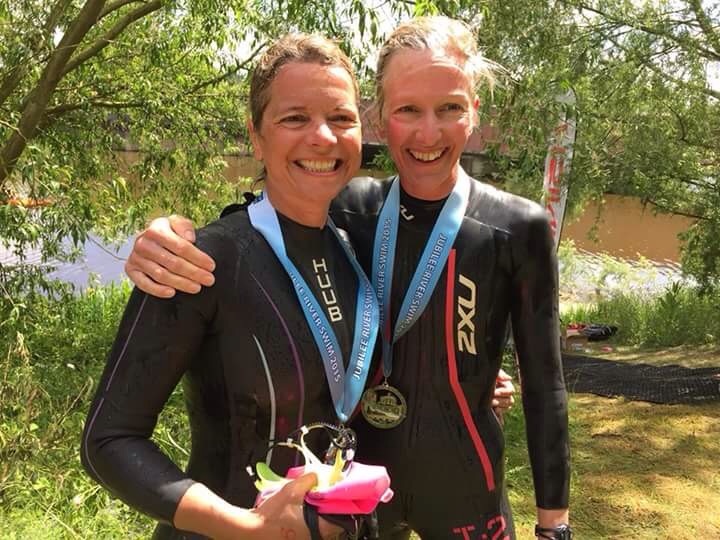 I’m really not sure how she managed it but she found my feet and stuck with me through the mahem – it’s very difficult to make out who is who when you are all wearing black wetsuits and the same coloured hats! Leg 1 flew by and we started leg 2 with smiles on our faces. I’m not sure how it happened as I had fuelled well beforehand but I ‘bonked’ at about 5k in and really lost the will to continue, which wasn’t helped by the fact that the fast swimmers who started behind us where now overtaking us at such a speed it made me feel as though I was swimming on the spot. A quick chat with Jo and I swam on her feet until we reached the end of the 2nd leg. I took on some food, water and a gel and immediately started to feel better, together with knowing that the longest leg was over I was now determined to finish. Oddly enough, I actually felt stronger as the swim progressed and could have continued swimming all day. So, what do you think about when you are swimming for over 3hours? Not a lot really! You can’t see much going on around you so a lot of what you take in is from sounds. I remember a plane flying over and thinking how noisey it was, low flying birds overhead that I thought where there to wait for me to be their lunch and just trying to work out where to swim. Very different to doing a long run, bike or walk where you can chat to others and have a varied terrain and scenery to pass the time. We finished the swim in about 3hrs 45mins but when I took off the pit stops we actually swam the 10k in 3hrs 11mins, which was well under our 3.5hr target time – well done us! Will I do it again? Probably not, but then I did say never again after running my first marathon!